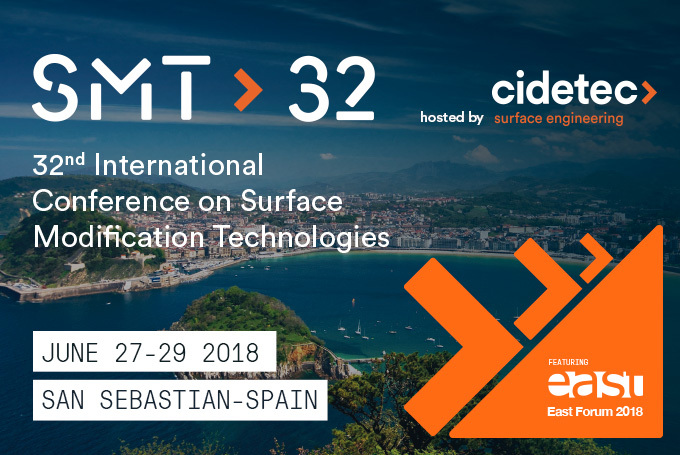 At the facilities of the Technology Park of San Sebastián, CIDETEC will be organizing the 2018 edition of the SMT (Surface Modification Technologies) that will bring together the main agents and international references in Surface Engineering to an event that includes in its program the celebration of the EAST FORUM 2018. The international conference, Surface Modification Technologies, is dedicated to the promotion and diffusion of research in surface engineering and in establishing ways of collaboration between scientists and engineers in all fields related to this discipline. It covers all areas of activity related to the modification of surfaces, from the methodology to the characterization of surfaces and their applications. The European Academy of Surface Technology (EAST) is an international non-profit organization whose main objective is the promotion, at a European level, of science, research and training in the field of surface technology and its related areas. EAST organizes an annual meeting (EAST FORUM) where the most relevant advances, projects and innovations are brought together. All the detailed information regarding this event will soon be made be available on the CIDETEC Surface Engineering website.